Sisters and Brothers, as I hope you saw at the end of June, July has a lot of ice cream related holidays because the entire month is "National Ice Cream Month". While yesterday was "Creative Ice Cream Flavor Day" today is our first Saturday Sacrament and in two days my home country will celebrate Independence -- not when we truly had it but when the fight began. The Fourth of July. 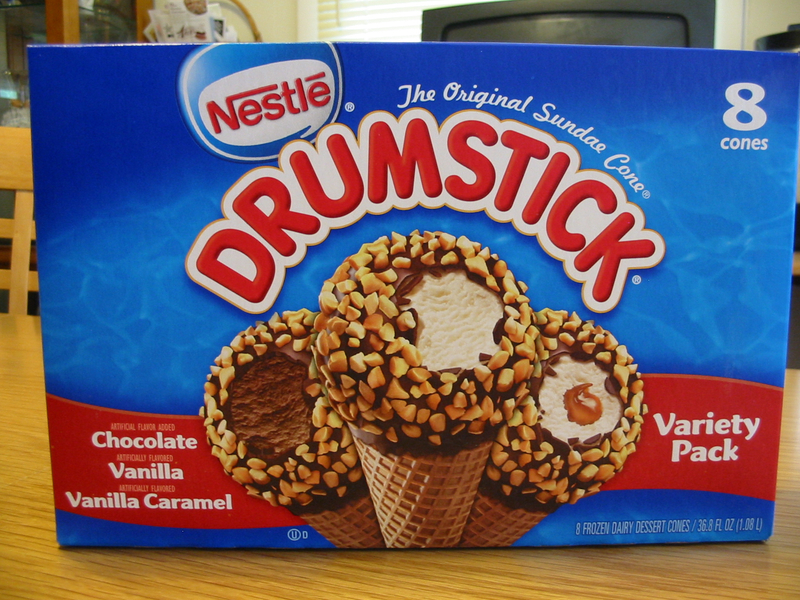 A few big names in ice cream have sent us coupons for Saturday Sacraments and we will start off with the folks from Nestlé-Dreyer's and their Drumstick brand. We used the two big coupons for free products to pick out two 8 count boxes which have a total of six different drumsticks in them. I found these are our local Walmart simply because it had the biggest selection to chose from. The Classic has three flavors: 2 Vanilla, 3 Chocolate, and 3 Vanilla Caramel. Of course they will all be covered in chocolate and peanut pieces with what I grew up calling a waffle cone. 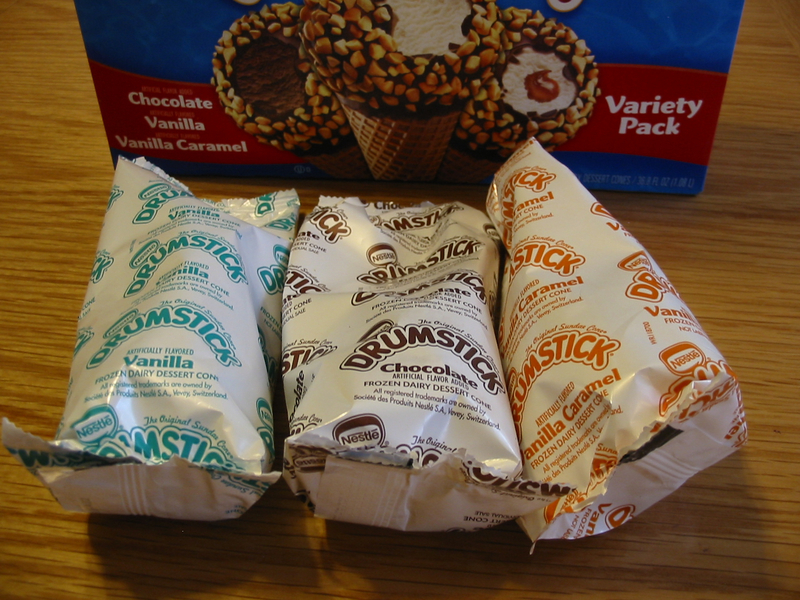 Each flavor is clearly labeled on the individual wrappers so you know which one you are picking. Just like labeling chocolates is a good idea for folks with allergies, this is good too though probably not so much for allergies as for the fact that people have different tastes. In terms of nutritional information these all have between 290 (Vanilla) and 310 (Vanilla Caramel and Chocolate) calories. The Vanilla Caramel has more sugars, the Vanilla has less sodium, and the Chocolate has more fiber but otherwise they are basically identical. 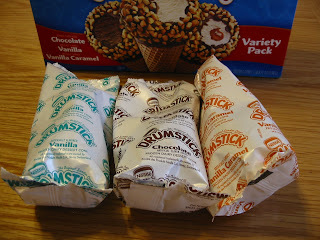 The Vanilla Caramel Drumsticks I shared with two other people and they both really liked this variety. 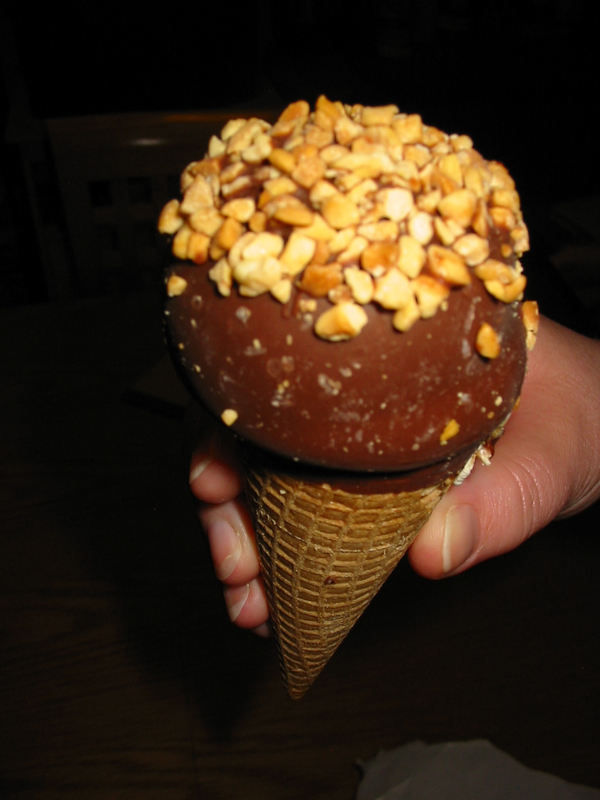 The treat itself measured about 5.75 inches tall and 2.5 inches wide across the chocolate covered ice cream scoop. As you can see there is a waffle cone topped by one scoop shaped chocolate covered section and covered with pieces of peanuts. Just unwrapped I couldn't really tell the variety until I leaned in and took a whiff. There is a strong caramel and then peanut scent but no chocolate or vanilla yet. Taking a swallow bite through the slightly crunchy peanuts reveals vanilla ice cream while a deeper bite shows a fairly large blob of caramel that has a dark color and a very tangy taste. Blended with the creamy vanilla and touch of chocolate the scoop was good but I wanted more chocolate. 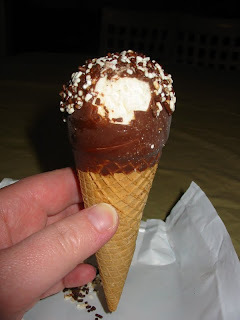 I got it when I got to the cone because the cone is lined with milk chocolate and taking bites makes a satisfying crunch each time. The ice cream continued to about 2 inches before the tip of the waffle cone. 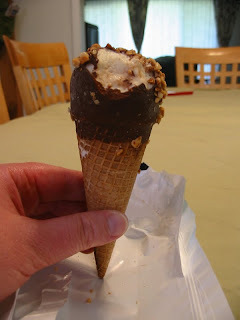 The caramel in the ice cream also continued straight down the cone until the final 1.5 inches where it was solid milk chocolate what the box calls "chocolatey nugget". The size and structure of drumsticks is the same for every variety so I won't repeat this information. The Classic Chocolate is the same approximate size with the same peanut pieces on top. It also smells like peanuts and tastes like peanuts until I've eaten off the top section of the shell. To the right you can see my hand again and the ice cream once I've eaten off the shell. The big challenge with chocolate ice cream is the flavor because cold can have a dampening effect on cocoa flavors often. 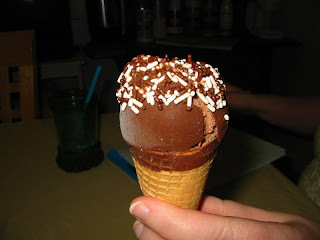 There was a definite light chocolate flavor to the ice cream itself but the over all chocolate essence increased with crunchy bites down to the milk chocolate filled tip tinged with waffle cone tang and sweetness. The Classic Vanilla flavor looks a lot like the Vanilla Caramel variety but without anything inside the ice cream itself. Not only did the vanilla's fragrance break through the peanut covered top slightly but for some reason the ice cream seemed very cold compared to the previous two varieties. It might have been the time of day I tried it but it really did feel colder which meant the normal vanilla kick I expect was really more creamy in taste and allowed a bit of the chocolate shell's flavor through. Both were overwhelmed by the peanuts however. 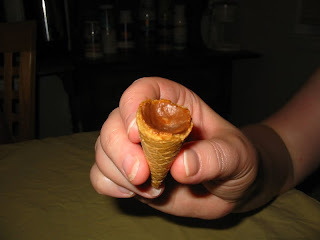 Getting through that and down to the waffle cone reminded me for the Drumstick I grew up with -- creamy, crunchy, a slight hint of milk chocolate that grew with each bite I traveled down the cone until I got to my favorite part. 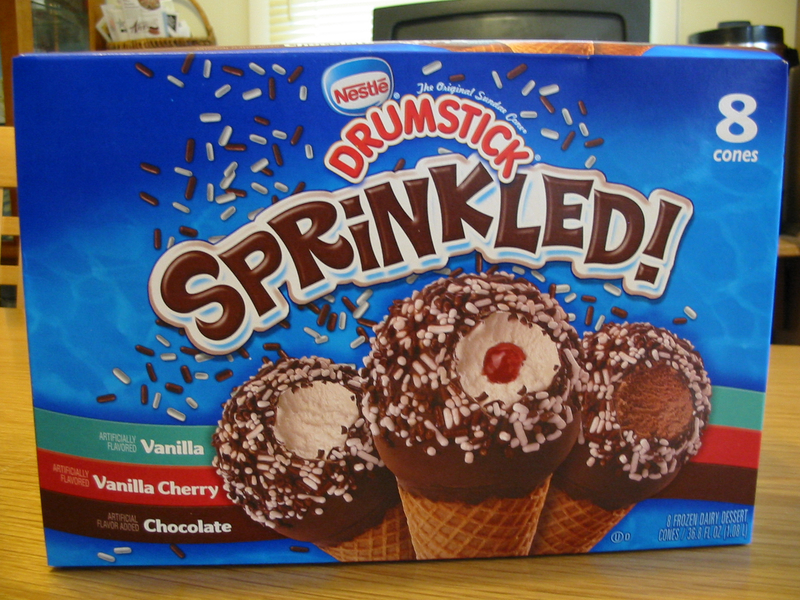 The Sprinkled has three flavors as well: 2 Vanilla Cherry, 3 Vanilla, and 3 Chocolate. Beyond the normal waffle cones and the chocolate shell over the ice cream scoop these also have chocolate and vanilla jimmies. Now many folks don't know what a jimmie is but when I see "sprinkle" I think more of the little colored sugar crystals I might use on cookies. These three varieties vary slightly in nutritional value with the Vanilla Cherry better with less fat and cholesterol even though it is larger by 4-5 grams compared to the other two. However it does have more sugars while the Vanilla one has a touch more fiber and the Chocolate a gram more protein. The Sprinkled Chocolate is the Classic but with sugar jimmies in vanilla and chocolate on top. 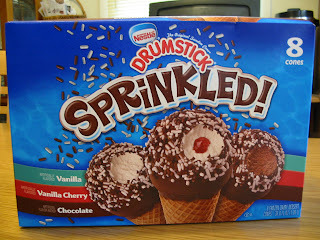 The sprinkles are very sweet, so much so that I started knocking mine off the top of my treat though others in the group I shared these with really liked that sweetness. I separated them out and yes, the white and the brown ones do taste different, the brown are a touch less sweet and have a hint of cocoa while the white were just too sweet for me. The scent through the chocolate shell is part sugar and part chocolate, something the peanuts didn't really allow for until you took a bite. The top section is so heavy with sprinkles that it broke into several pieces I hope you can see in this photo, Sisters and Brothers. The ice cream seemed more bitter than in the original version but that might be in comparison to the sugar jimmies or the peanuts; I really preferred the ice cream here. 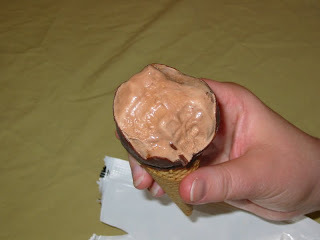 As I licked down the ice cream and started crunching away at the cone, more and more chocolate flavor with each bite, I accidentally licked and sucked too hard and with a big old SCHLORP the rest of the ice cream, a good inch and a half of it, came up out of the cone. That left me with nice waffle cone crunch and flavor balanced by good milk chocolate. The Vanilla Sprinkled is pretty much the same as the Classic minus the peanuts so let's see if it tastes different. It does because the vanilla's flavor has no real competition beyond the sugary sprinkles. This also means that the chocolate shell on top of the ice cream comes out more strongly. Once more the vanilla ice cream seems colder in my mouth. As I eat it down and the chocolate gets stronger, the vanilla still comes through reminding me of the from scratch chocolate our Chocolate Fruit Acolyte and I made before Christmas. A good balance of cone, chocolate and vanilla that I can strongly approve of. The Vanilla Cherry is the all new flavor in this book like the Vanilla Caramel was for the Original variety. 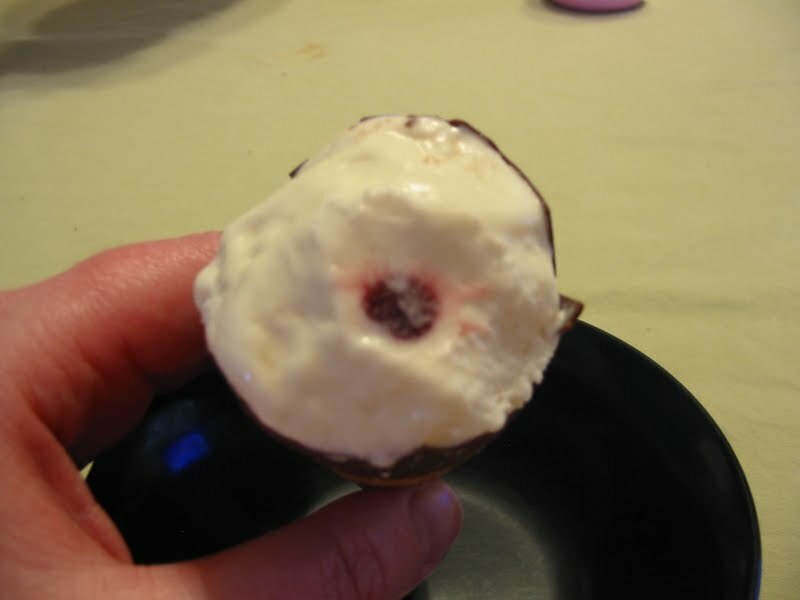 Mine had some cherry gel outside the shell but when I looked at it, I didn't see a break in the chocolate coating. Taking a bite right there didn't reveal any more of the gel so I have not idea how it got there. Given that it took a while to get to the cherry gel you see in the photo, you'd think this would be like the Vanilla flavor, right? Nope. This vanilla was more creamy, less cold, and when I hit that cherry gel it was thick, tart and yet sweet. I could move it around with my tongue or eat around it as I wanted but it went all the way down to the chocolatey nugget at the bottom of the waffle cone. Over all these Drumsticks were much like my childhood memories recalled them to be -- fun treats but not treats I should have all the time. They do have real cocoa and chocolate but also a lot of added natural and artificial stuff which makes the ingredient list long. It's good that the boxes are made of 100% recycled materials and can be recycled but here's to hoping that they can stop taking out the cocoa butter and adding in all the other oils on the list both for our health and for the survival of cacao. They are an adventure of texture going from peanut or sprinkles to smooth chocolate shell to cold ice cream and then the crunchy cone. 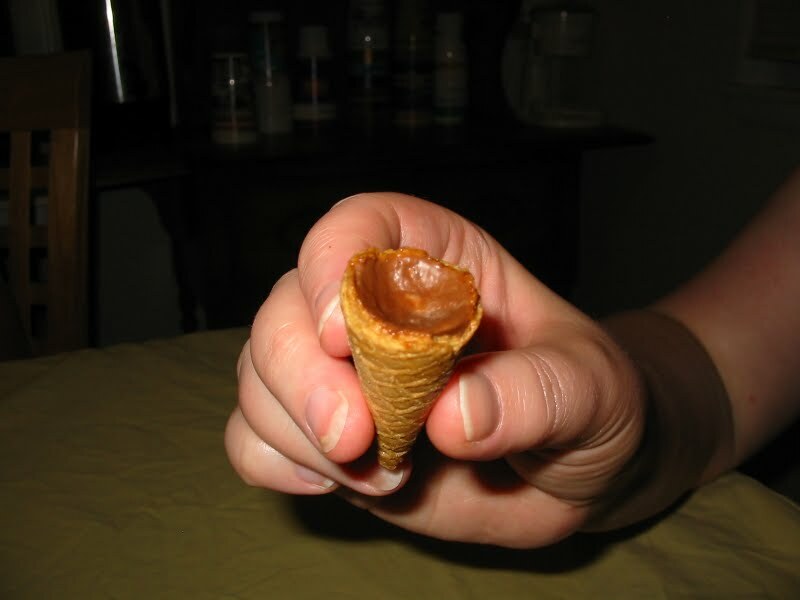 In terms of chocolate flavor that builds with each bite down the cone. I do have a favorite: Sprinkled Chocolate because you get a lot more of our Sacred Substance for your mouth and your money compared to the other flavors. When I think of the Fourth of July, I think of fireworks but also of parades with lots of drums and that's why I decided this was a good time to reveal the old favorites and the new variation of Drumstick. While taking a quart or more of ice cream to a picnic or even out camping seems like a lot of space to give over to ice cream, these individual treats seem like a great way to have just enough and to have enough variety to satisfy most folks. 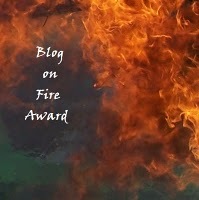 So what did you think, Sisters and Brothers? Will you be taking these with you to your Fourth of July events or adding them to your summer routine? 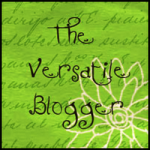 These icecreams are looking really yummy and a great post! The sprinkled chocolate cone is so mouth-watering! 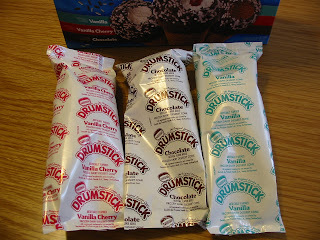 those ice cream drumsticks are the best and they always taste so good! i like how you reviewed all the ones i have never tried. now, i wanna try the vanilla cherry one! 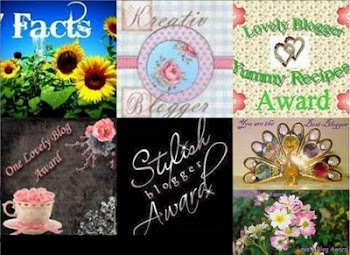 They have a few variations now, so look around briarrose and let us know what you tried.